These bars are so moist and chewy. No baking involved, only 7 ingredients plus water and they take 10 min to make! 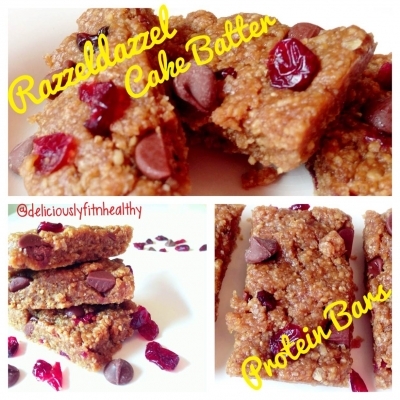 They are so delicious and taste like a yummy desert bar rather than a clean protein bar!! I used pbcraves razzeldazzel peanut butter. It has little chocolate and white chocolate chips with a hint of RASPBERRY in it AND its not more calories.These bars are AMAZING! â€¨â€¨â€¨Blend all ingredients in a food processor except water,maple syrup,chocolate chips, and craisins. Add water and syrup little by little to make sure it blends well and you can make sure the consistency isn't overly sticky. (it should make a thick grainey texture you should be able to press into a pan) If it seems overly sticky add a little more protein powder or oats. With your hands mix in chocolate chips & craisins and press dough into pan OR press dough mix into an 8X8 pan and press the chocolate chips into the tops of the bars. Let the pan set for 30 min at least so it can settle. Cut with a sharp knife into chewy moist almost gooey bars. Whoala you have homemade protein bars! !